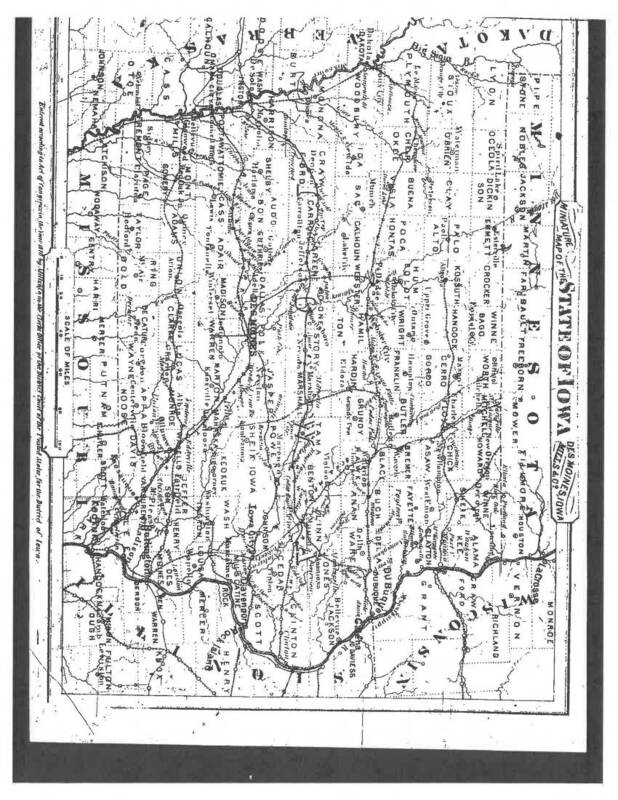 MINIATURE MAP OF THE STATE OF IOWA DES MOINES, IOWA MILLS & Co. [including:] [state:] Iowa [Iowa Counties:] Lyon, Oceola, Dickinson, Emmet, Crocker, Winnebago, Worth, Mitchell, Howard, Winnesheik, Alamakee, Clayton, Chickasaw, Floyd, Cerro Gordo, Hancock, Kossuth, Palo Alto, Clay, O'Brien, Sioux, Fayette, Bremer, Butler, Franklin, Wright, Humboldt, Pocahontas, Buena Vista, Cherokee, Plymouth, Woodbury, Ida, Sac, Calhoun, Webster, Hamilton, Hardin, Grundy, Black Hawk, Buchanan, Delaware, Dubuque, Jackson, Jones, Linn, Benton, Tama, Marshall, Story, Boone, Greene, Carroll, Crawford, Monona, Harrison, Shelby, Audobon, Guthrie, Dallas, Polk, Jasper, Powesheik, Iowa, Johnson, Cedar, Clinton, Scott, Muscatine, Louisa, Washington, Keokuk, Mahaska, Marion, Warren, Madison, Adair, Cass, Pottawattamie, Mills, Montgomery, Adams, Union, Clarke, Lucas, Monroe, Wapello, Jefferson, Henry, Des Moines, Lee, Van Buren, Davis, Appanoose, Wayne, Decatur, Ringgold, Taylor, Page, Fremont [state:] Minnesota [Minnesota Counties:] Pipestone, Nobles, Jackson, Martin, Faribault, Freeborn, Mower, Fillmore, Houston [state:] Dakota [state:] Nebraska [Nebraska Counties:] Dakota, Burt, Dodge, Washington, Calhoun, Douglas, Cass, Otoe, Johnson, Nemaha [state:] Wisconsin [Wisconsin Counties:] Monroe, Vernon, Richland, Crawford, Grant [state:] Illinois [Illinois Counties:] Jo Daviess, Henry, Mercer, Henderson, Warren, Knox, Fulton, McDonough, Hancock [state:] Missouri [Missouri Counties:] Keokuk, Scott, Schuyler, Putnam, Mercer, Harri, Gentry, Nodaway, Atchison SCALE OF MILES 0 10 20 40 60 80 100 [also including many numerous rivers and towns (some illegible); many of the towns on this map have older names] Entered according to Act of Congress in the Year of [? 1870 ?] by Mills & Co in the Clerks Office of the District Court of the District Court of the United States for the District of Iowa.